I wanted to start with a fresh, cold appetizer since we were going to be eating a hot dinner and opted for Garden Rolls. I LOVE GARDEN ROLLS! I get them every time I see them on a menu and have been experimenting with my own for the past few years. 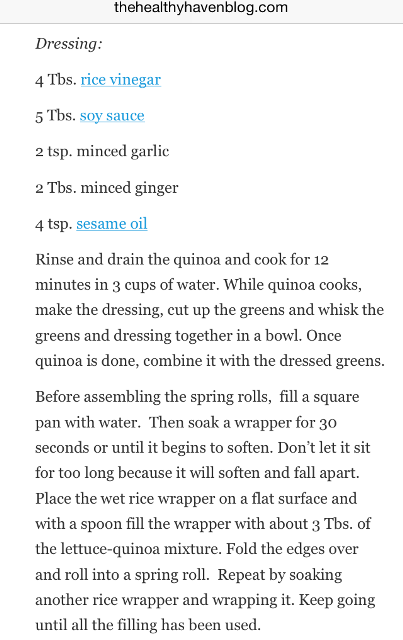 I found a recipe for Sesame Quinoa Spring Rolls and decided to try it out…but of course, I added my own ingredients as well. Soak Rice Paper in Hot Water until it’s soft then lay it on a flat surface (I tap mine with a paper towel to get rid of the extra moisture) Fill the Rice Paper up with all of the ingredients I do Basil on Rice Paper then the Lettuce Leaf on top of the basil and then just fill the bad boy up! 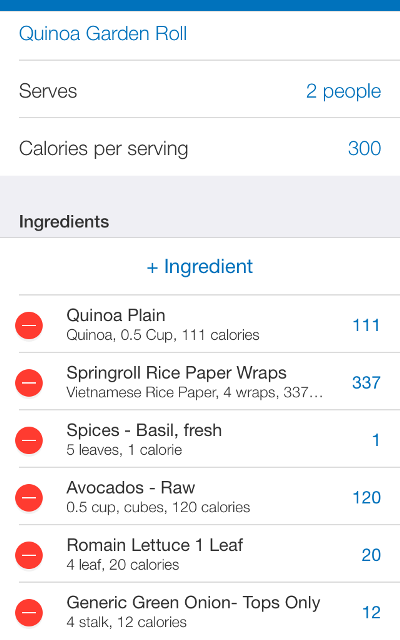 Add The Dressing Provided by The Healthy Haven Blog & some Sriracha and roll it together like a burrito. 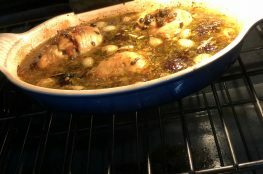 Thank you Betsylife.com For this AMAZING Spicy Hoisin & Sesame Glazed Corn & AllRecipes.com for the Cilantro Lime Tofu Marinade. 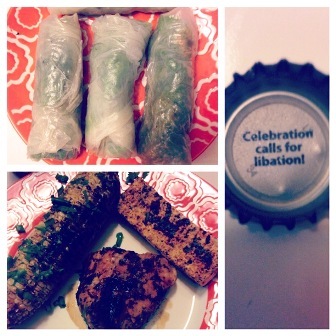 If you are a beer drinker, you may recognize the font of the message in the bottle cap, Magic Hat #9 was the perfect pairing to last night’s delicious feast! *As you can tell there is also a piece of chicken on the plate but Jim prepared that one and I have NO IDEA what he did.